Do You love Scottish Terriers? Do you wish you knew how to cut their hair? Students enrolled in Furry Tails School of Dog Grooming will learn the Breed Standard Cut for Scotties as well as many other popular breeds. Interested? Give us a call 908-359-7387 or e mail furrytailschool@gmail.com to discuss our Grooming program. We look forward to hearing from you. Do you love dogs and wish that you could work in a field that allowed you to interact with them on a daily basis? Well you can! In as few as three months you too can become certified and start a rewarding career in dog grooming. If you're interested in joining the fun please give us a call 908-359-7387 or e-mail. furrytailschool@gmail.com. we look forward to hearing from you. Thinking of Dog Grooming as a carer? Here are just some of the dogs we worked on today at Furry Tails School of Pet Grooming. Students enrolled in our program will learn proper handling, canine cleanliness, and popular breed cuts as well as breed specific cuts. If you are interested in a career that combines your love of animals and sense of style please contact us to discuss what our program may have to offer. Considering a career in Dog Grooming? Now is the perfect time to become certified and start that job you've always wanted. 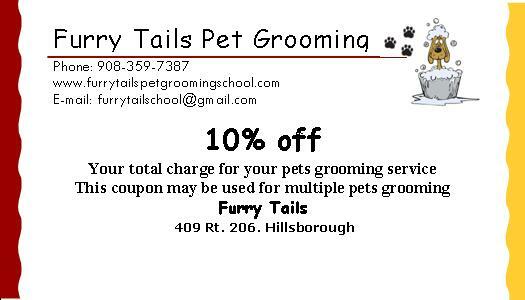 Furry Tails School of Dog Grooming is currently enrolling new students for the Fall Semester so if you have a Passion for Dog Grooming please contact us with any questions regarding our program that you may have. We look forward to hearing from you. Beat the Heat with these Summer Savings!!! Furry Tails Dog Grooming has a number of ways to help you save money While also keeping your pup cool, clean and looking there best! Now all CASH transactions on a FULL GROOMING SERVICE will receive 7% OFF. (This Promotion may be used with our Coupons). If you are a volunteer firefighter bring your photo ID card and receive a 15% discount as our way of saying thank you for your service and dedication. If you’re a senior citizen and having your pet groomed please ask one of our staff about receiving the 10% senior discount. Download and Print $6 off Coupon Now! Download and Print 10% off Coupon Now! Become a certified pet groomer at Furry Tails pet grooming school. 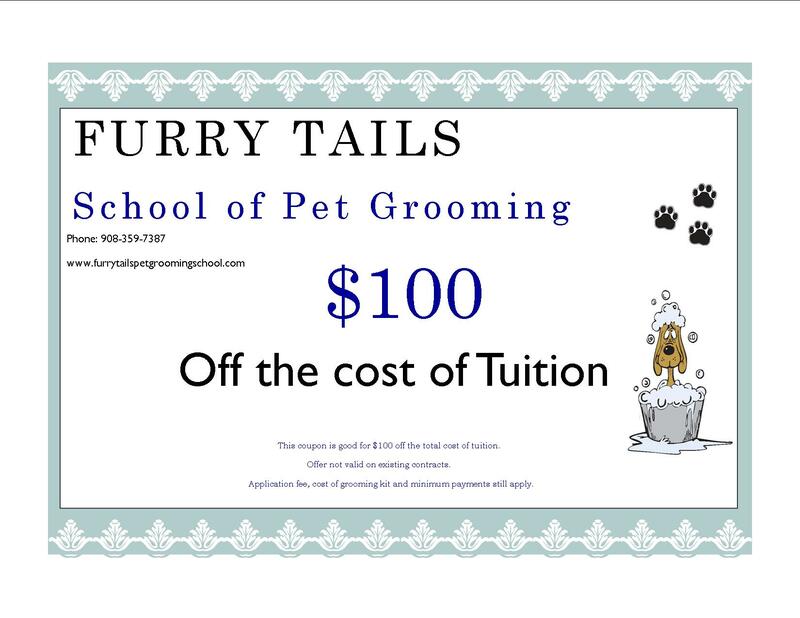 If you are considering becoming a groomer and are looking to earn your grooming certificate we are now offering $100 off the cost of tuition to all new applicants. Simply download, print and bring in this coupon when you apply. Please ask a Furry Tails Associate about any of these great deals! Have a great Summer and we hope to see you soon! PLEASE HELP THESE PEOPLE FIND THEIR LOST DOG. Is the hot weather to much for your pup to handle? Is there coat shaggy and in need of a good trim? Are you finding so many little puffs of dander all over that you can no longer see the kitchen floor? Then please give us a call to schedule an appointment (908) 359-7387. In about three hours we can have them shaped up and looking their best. Congratulations to Marla! Marla graduated from Furry Tails School of Pet Grooming on April 10th and has recently been employed in the Grooming department of the Petco in Parsippany New Jersey. Congratulations to Leah! Leah graduated from Furry Tails School of Pet Grooming on Thursday May 29th. She is currently Employed at the Phillipsburg Petco as a Bather Brusher and will soon be transitioning to a full time Groomer for their shop. She is a very talented Groomer who has been working hard at this business for some time and who will certainly excel in the field of Grooming. We wish her all the best. Congratulations to Izzy who recently graduated from Furry Tails School of Pet Grooming! Not only is she an amazing Groomer of Dogs but also a super talented hair stylist for people. If you're interested in learning Dog Grooming as a career please give us a call at (908) 358-7387. or e-mail furrytailschool@gmail.com. We look forward to hearing from you.